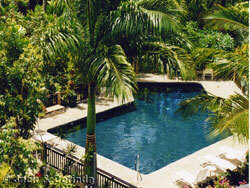 Our Kauai Prince Kuhio Condos provide affordable accommodation and lodging and are offered by individual owners. Our condo property is shown in this photo and is about 10 yards from the beach next to Prince Kuhio Park in Kauai, Hawaii on the sunny south shore of Poipu Beach. Prince Kuhio Condos has only 71 condo rentals and is nestled between the beautifully landscaped Prince Kuhio Park on one side and a lush, tropical garden and pool on the other side. It is perfect for your vacation or honeymoon. From wall-to-wall windows there are ocean views, park views, mountain views, and a view of the sunrise! Our Kauai beach condos are so close to the ocean you can hear the waves from the bedroom at night. 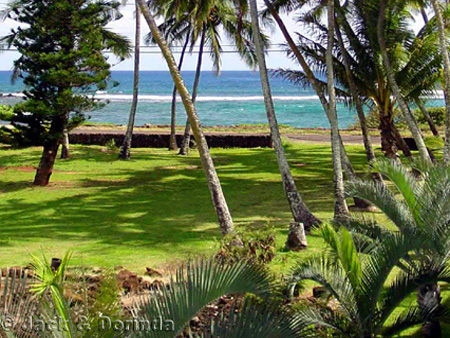 There are two of Kauai Hawaii's most popular beaches in front of our vacation condo rentals. Prince Kuhio Beach has excellent swimming, snorkling, and diving and is famous for the sea turtles you swim with while snorkling. Sometimes you can also see whales breaching and frolicking in the distance. The other, Lawai Beach, is one of Kauai's top snorkling beaches but also has 3 prime surf spots: PK's, Centers, and Acid Drop. The surfers and body boarders are regulars at this Kauai South Shore beach. Entertainment is within minutes of our centrally located Kauai condo rentals. Two golf courses are less than five minutes away - Kiahuna Country Club, and the championship Poipu Bay Resort Course - site of the PGA Grand Slam of Golf. For open ocean dives, as well as sport fishing, sailing, and ocean tours, go to the nearby Kukuiula Harbor for charters. Tennis lessons, matches, or round robins can be arranged at either the Kiahuna Tennis Club, Poipu Kai Resort, or the Hyatt Hotel Tennis Club - all within a short five minute drive. 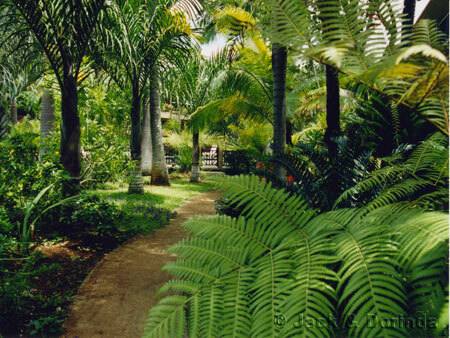 A variety of restaurants and shops are a few minutes away in Old Koloa Town (circa. 1830) or the Poipu Shopping Village. Also dinner is served right next door at the Beach House Restaurant - highly rated for good food and magnificent Poipu sunset. The best in Kauai oceanview rentals can be enjoyed inside our privately owned Kauai beach condos. Please select from our condos below by clicking the picture of the condo for more information. Our Prince Kuhio condos are shown below. You can search by availability by dates or browse all the condos to find your favorite.